Headlights With Your Lights So Bright, Won’t You Guide My Car Tonight? When the sun goes down and it gets dark outside, a driver’s ability to see the road becomes a lot more of a challenge. Luckily, all vehicles are outfitted with headlights to help illuminate the road ahead. Over time, just like any light, they can begin to dim or burn out altogether. Driving around with just one headlight could pose a danger to yourself and other drivers as well as put you at risk for a traffic violation. If you’re in the dark about your car’s headlights, we’ll shed some light on everything you need to know about your car’s lighting. How Many Lights Are Out? If you notice just one headlight out, as opposed to two, you can assume that just one bulb has burned out and requires a replacement. If two headlights go out at the same time, however, though it may seem coincidental, it’s not common and will require further examination. If your vehicle is equipped with halogen lights, like most, you can expect your headlights to run for 500 to 1000 hours. If your lights haven’t lasted quite that long, something may be wrong and needs to be investigated to determine why they didn’t last longer. If just one headlight goes out, it’s safe to assume that the bulb has burned out. To be sure, check the connections to make sure there isn’t any damage or noticeable corrosion. It’s not unheard of for connections to come loose. 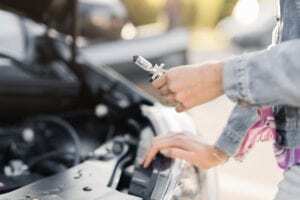 However, it is advisable that you have a professional determine what has caused the connection to come loose and have it repaired right away. Check the assembly for condensation, as water can get in if the housing is cracked or a seal has worn. If this is the case, the whole headlight assembly will require replacement. When two headlights go out at the same time, a power failure is most often to blame. A headlight relay, module, main switch, or fuse could be the cause of the failure. A technician will need to test the power to each headlight in order to determine the exact cause for repair. What Does It Mean if My Lights Are Dim? Are your lights working but not as bright as they once were? If the lights tend to dim when the engine is idling, and the brightness decreases with RPMs, this could indicate an issue with the electrical system. Check to ensure the battery and alternator are functioning properly and inspect the vehicle for any loose belts. A bad connection or ground could also produce a dim light. Another reason your lights may seem dim is due to discoloration of the light cover. Over time the UV rays from the sun damage the plastic cover protecting the headlights, causing the lights to dull and lose their brightness. This can easily be resolved using a special cleanser and scrubbing tools. Replace burned out bulbs as soon as possible. Driving with one or both headlights out is not only dangerous, but it may also be illegal depending on your state’s laws. Most states require all vehicles, with the exception of motorcycles, to have two functioning headlights and must be utilized from dusk until dawn. If you are pulled over for having a headlight out unbeknownst to you, the officer may simply give you a warning and advise you to have it fixed right away. If you are given a violation, in many cases, you just need to show proof of correction and pay a small fee to the court. If you continue to drive without repairing the light, you may receive a traffic violation on your driving record and may have to appear in court. Can I Replace Them Myself? Open the hood. Believe it or not, the best way to access the headlight is through the hood of the vehicle. Do not attempt to remove the outside light cover. Unfasten the electrical connecter that sticks out the back of the headlight. Note: Some vehicles require the whole assembly to come off. Assemblies are typically held on by screws or mounting pins. Removal of the screws may take a good amount of time as they may be difficult to access depending on their placement. Locate and remove the bulb by gently turning it to the left. Wearing gloves or using tissue or cloth, install the new bulb. Take extreme caution not to touch the bulb or assembly. Oil or smudges left behind from your fingers can create a hot spot on the glass causing halogen bulbs to burn out faster. Reconnect the electrical connection and test the bulb. Repeat steps for the other headlight. Can I Replace My High Beams? High beams are a great feature to have when you’re traveling on roads with little to no lighting. Using your high beams gives you a better, wider range of view while driving. Most modern vehicles are equipped with headlights that have two settings including the low setting and the high beams so, you won’t need to replace both. In the past cars used to have separate bulbs for the high and low beams. High-end and performance cars are often equipped with separate bulbs such as halogen lights for their low beams and a Xenon HID bulb for high. Note: These bulbs are not interchangeable. You can tell if your vehicle requires two or four headlight elements by simply looking at your car. If you have two elements on each side of the vehicle your vehicle likely has separate high and low beams. If you have just one element on each side, your vehicle is equipped with a dual filament bulb that is used to operate both the low and high beams.